Yesterday we had the opportunity to see my nephew Brody, who was adopted by Rachel (my sister) & Randy six months ago, sealed in the temple to his family. The sealing was beautiful and the feeling of love in the room was so strong. Seeing Randy, Rachel, Brock & Brody enter the sealing room all dressed in white as a family was such an amazing sight and is something I will never forget. I know little Brody and sweet Brock were meant to be a part of Randy and Rachel's family from the beginning and that it wasn't by chance their birth mother's were led to them. This is Brody's birth mother Chanel (in navy) and her family. Chanel is one of the most amazing young women I have ever met. As soon as she met Randy & Rachel, she says she knew the baby she was carrying in her tummy was meant to be theirs and that she was bringing him into this world for them. I admire her so much for loving Brody enough to give him a better life than she knew she could currently give--with two loving parents and the chance to be sealed to an eternal family. 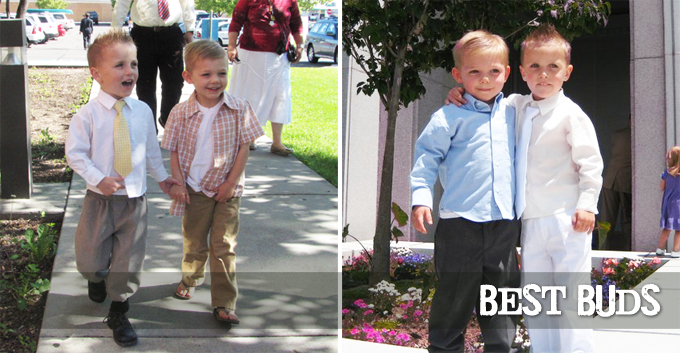 Bryson and I also had the chance to attend Brody's adoption finalization in the Provo Courthouse. As I sat and listened to the judge pronounce Brody officially theirs I couldn't help but start crying because it made me think of not only the sacrifice of Bryson's amazing birth mother, but all of the birth mother's throughout the world that give couples like Rachel & Randy and Mike & I the chance to be parents and have families. Without their loving, selfless sacrifices couples like us would never have the hope of having a family. I'm sure these two were best buds up in Heaven and thanks to each of their birth mother's they get to grow up as best buds and cousins here on Earth. I love my little nephew and am so happy he's now "officially" part of our family. Adoption is such a blessing!! !